Ensuring we don't destroy the planet we live on is one of the few things the overwhelming majority of people tend to agree on, so much so that we've developed treaties and international agreements expressing as much that are renewed usually renewed every few years. The Paris climate agreement is one such recent example that was made to help offset the damage done by previous generations who never took into account the global impact their lackadaisical business practices and overall indifference to the environment could have. Recent studies have been pretty alarming and have told us exactly what the long-term effects on both our and the planet's health are, and it doesn't paint a pretty picture, even less so when you consider that our current measures that we've put in place still aren't enough to help reverse the damage. Yesterday, President Donald Trump announced that he plans to pull out of and potentially renegotiate the Paris climate agreement. The 2015 agreement commits the US and 195 other countries to keeping global temperatures "well below" 2C above pre-industrial levels by limiting human carbon emissions. The United States is the second biggest carbon emitter in the world, and the UN World Meteorological Organisation warned that by pulling out, the US could add 0.3C to global temperatures by the end of the century. The United States joins Syria and Nicaragua as the only three countries that aren't part of the agreement. Nicaragua refused to join because they believe that the agreement doesn't go far enough to protect the environment, while Syria has been ravaged by civil war. But not everyone is ready to drop out of the pledge. Amazon, Apple, Google, Facebook, and Microsoft were among the many companies that pledged to fight climate change after the announcement. And last night, cities across the country decided to light monuments in green to show their support. 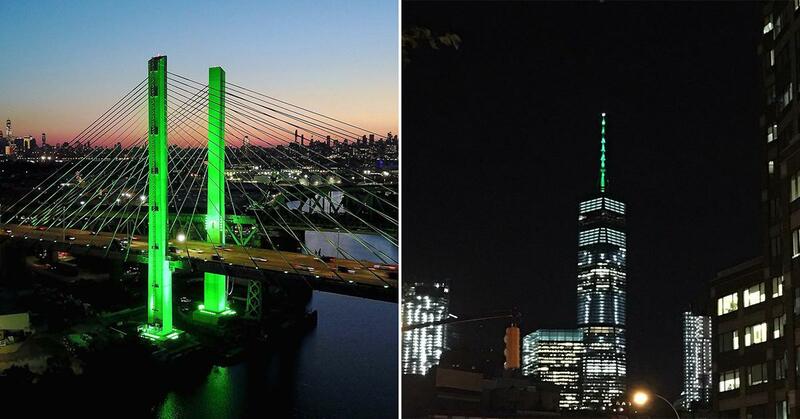 Governor Andre Cuomo and Mayor Bill de Blasio of New York shared photos of sites across New York City illuminated by green. In Boston, the city hall did the same. Mayor Marty Walsh is one of 61 city leaders who co-signed a letter in the wake of the announcement. And steps away from the White House, the Wilson Building in Washington D.C. joined in on the protest. International cities also showed their commitment to the pledge despite the United States pulling out. What do you think about Trump's decision?